Not (the path) of those who earn Thine anger, nor of those who go astray. …is an expression for that upward course, which may also be expressed by “The Faith”, “The Mansions of Right Guidance”. Were there no relation between the two worlds, no inter-connection at all, then all upward progress would be inconceivable from one to the other. Therefore, the divine mercy gave to the World Visible a correspondence to the World of the Realm Supernal, and for this reason, there is not a single thing in this world of sense that is not a symbol of something in yonder one. Having created a symbol with correspondence to the Realm Supernal, Allâh explains the symbol through revelation so that man may perceive the deepest layers of meaning in the world around him. This, then, is a reflection upon the tree as universal symbol and its explanation in Islam. Throughout Earth and history, man has seen the tree as a link between worlds. The tree as a haunt of malevolent spirits has been feared and avoided; as a home of helpful spirits, consulted and worshipped; as a bridge to heaven, climbed by mythical heroes; as a symbol, ascended by reflection. The tree appears universally in art and architecture, literature and scripture, used by the wise to turn men’s minds to the beyond. Large, living, immovable, the physical nature of the great woody plant called tree explains partly its pre-eminence among symbols. The tree is the largest living thing on Earth, rivaled in sheer size only by mountains and bodies of water in the struggle for man’s attention. Upon examination, the tree embodies life’s mysteries: origin, growth, death. Sprung from a tiny seed in inert clay, the tree grows without apparent nourishment, sprouting anew if cut, dying in winter, living in spring. Even those who claim to understand the tree’s secrets in terms of chlorophyll and photons are amazed by the gigantic column of living matter that is a tree. Immovable yet supple, the tree became a model for human architecture and a model of divine architecture. In constructing his hut, his miniature cosmos, man relied heavily on the structural lesson of the tree. A vertical pole may be made to defy gravity by planting it deep in the Earth. Horizontal elements may be supported by the vertical pole, creating shelter from the sun and rain. Primitive structures, with roof supports radiating from a central pole, often take on the very appearance of a tree. The tree was a mediator between divine cosmos and human micro-cosmos. Through it man saw how Allâh structured the infinite, mysterious universe, and how he could imitate divine creation on a small scale. The tree was both a practical model for construction and a mystical model of the universe itself; so the upright pole/axis mundi retained its mysterious stabilizing function even beyond its structural function of supporting a building. It became a universal symbol of order in the midst of chaos. We send down purifying water from the sky, that We may give life thereby to a dead land, and We give many beasts and men that We have created to drink thereof. (Qur’ân XXV: 48-9). Waters appears universally in mythology as the undifferentiated substance from which creation took form, the primeval source of being. Have not the infidels seen that the Heavens and the earth were of one piece? Then We rifted them asunder, and from the water We made every living thing (Qur’ân XXI: 30). In the beginning God created the heaven and the earth. And the earth was without form, and void; and darkness was upon the face of the deep. And the Spirit of God moved upon the face of the waters (Genesis I:1-2). There was nothing whatsoever here in the beginning. By death indeed was this covered.… He created the mind, thinking, “let me have a self”.… From him…water was produced.… That which was the froth of the water became solidified; that became the earth (Brhadaranyaka Upanisad 1-2). From the scientific evolutionary perspective, water is the original context of all earthly life. In the deepest layer of man’s memory is water, and the first amino acids mingling tentatively in a thin organic soup. Imagine a tree, its roots sunk deep in the earth by a spring, infused to the tips of its leaves with life-giving water, the blood of gods and the essence of creation. The special connection between tree and water is paralleled by the conceptual association, through verticality, of tree with mountain. The vertical dimension is uniquely experienced by man, who moved from the horizontal world of the animals to the world of the erect spinal chord at the same time his mind developed the capacity to perceive a mystical vertical dimension that points beyond. All progress, spiritual or material, is to man, upward progress, an extension of his upright spine. Tree and mountain, the two mightiest features in his world, confirm this upward idea by their vertical axes, reflections of the divine axis mundi of mysterious verticality. “Seek lore, even if it be in China”, said the Prophet. Possibly the earliest written allusion to the Axis Tree comes from the Persian Gulf circa 3500 B.C. in an Akkadian manuscript. In Eridu, a stalk grew overshadowing; in a holy place it did become green. Its roots were of white crystal, which stretched toward the deep.… Its seat was (the central place of the Earth). Its foliage was the couch of Zikum the (primeval) mother. Into the heart of its holy house, which spread a shade like a forest, hath no man entered. There is the home of the mighty mother who passes across the sky. In the midst of it he saw a divine and beautiful tree toward which he hastened. On its gleaming branches hung clusters of precious stones, and its leaves were of lapas lazuli. A recurrent scene in Assyrian reliefs depicts the king standing beside a tree and accompanied by genii who seem to be plucking its leaves and giving them to the king or applying them to his person or weapons. Similarly, in Egypt, the Pharaoh is often depicted standing by a tree with supernatural beings. A common Egyptian cosmology places a tree at the centre of the universe with Bennu, the Sun God, in its branches. Archaeological evidence from the palace of Ras Shamra in Caanan links the tree with fertility. The sacrality of the tree in Caanan is borne out by the Biblical condemnations of the Caananite “altars under green trees”, and the prohibition of planting ashera (sacred trees or posts) by Yahweh’s altars. Though the Hebrews condemn pagan tree cults, a tree stands in the centre of their Paradise, and trees even take on a pagan oracular function in II Samuel where David is told by “a rustling sound in the tree tops” when to attack the Philistines. The tree retains its importance in Christianity, some holding that the tree is the archetype for the cross itself. Honor to Haoma … his branches bow down that one may enjoy them. To the soul he is the way to heaven. In the beginning Ormazd gave to Haoma the girdle glittering with stars, wherewith he girdled himself upon the tops of mountains. R. Gordon Wasson’s book, Soma: The Divine Mushroom of Immortality, which offers a convincing argument to identify the Vedic Soma and the Avestan Haoma with a hallucinogenic mushroom, throws out much of the speculation that Soma and Haoma are primarily axis trees. However, in later passages of the Zend-Avesta, Haoma did become a divine tree, long after the hallucinogenic prototype had been forgotten. In Mithraism a dual tree symbolism was popular, the two trees apparently representing the poles of the universe. The Esquiline Mithraeum contains two trees painted on opposite sides of its vault, one in full leaf and the other dead, and with the sun and moon in their branches. Also in Mithraism is the myth that life originated from a tree, and paintings depict oracular “talking trees” with heads on their branches which were very popular in later Persian poetry as waqwaq trees. Not only was the tree of symbolic importance in many of the religions that preceded Islam in the Middle-East, but it was also a popular object of superstition and religion in the pre-Islamic paganism of the Arabian Peninsula, the soil of Islam. Trees were commonly thought to be the abodes of jinn, supernatural beings, (ancestor of “genie” and “genius”), and were even considered to embody jinn. The Arab pagans, along with the rest of the Middle-East, ascribed a divinatory function to certain trees. There was a sacred tree near Mecca, the sacred acacia of Nakhla, where lived the goddess Al-Ozza. In an annual ceremony, the Meccans hung weapons, garments and ornaments on the tree—thus its vague mention in the Hadîth literature as the “dhât anwât”, “tree to hang things on” In his Travels, Sir W. Ousley mentions an oracular date palm near Nejran in Yemen which was still, in modern times, adorned annually with clothes and ornaments. Though the Prophet banned divination, the association of trees with oracles persisted even among the faithful. Muslim ibn ‘Uqba, in a dream, heard a gharcad tree tell him to lead the army of the Yazid against Medina. Numerous beliefs in the supernatural nature of trees persist, in fact, to the present in the Arabian peninsula. A sick man may sleep under a tree to receive counsel in a dream for his recovery. Arabs often represent the Zodiac as a twelve-branched tree, with its fruits shown as stars. Many of the pagan tree associations that have survived in the Arab world have been Islamicized, so that, for example, trees may be thought of as places where instead of jinn, angels descend. Modern Muslims consider it good luck to sit under a sidra or lote tree, a species of plum which, in the Qur’ân, the Prophet saw in Paradise. In the middle of the Sh‘bân, the eighth Muslim month, it is said that the sidra tree in Paradise is shaken. Each of its leaves bears the name of a soul, and if his leaf falls off, that person dies within a year sooner or later depending on how withered the leaf is when it falls. Much of the tree lore from the pre-Islamic Middle-East and the rest of the world bears a striking resemblance to the sacred tree that developed in Islam, but between noting similarity and proving influence there is a mountain of scholarship, a mountain which I will not try to scale. Nevertheless, only the staunchest fundamentalist would deny that the World Tree of Islam does have roots in Middle-Eastern mythology and deeper-roots in the universal consciousness of man. Islam’s borrowing from existing traditions is not, however, a weakness, but a strength. By manipulating and elaborating on existing symbolism and superstition, Islam has been able to capture and move the minds of men of widely varying status, intelligence, background and language. This process of manipulation and elaboration begins in the Qur’ân, but it is broadly and liberally extended in the Hadîth literature and among the mystics. The Islamic “Tree of Bliss”, in its final form, incorporates roughly equal parts of Qur’ân and Middle-Eastern mythology, along with a significant contribution from Muslim scholars and mystics. The tree symbol plays only a minor role in the Qur’ân itself, yet among the mystics and in Muslim art and architecture it became one of Islam’s most developed symbols. The Shajarat al-Tûba, “Tree of Bliss,” the Islamic World Tree, does not appear in name or description in the Qur’ân. Instead, there are several distinct supernatural trees. Only in the Hadîth and among mystics are the various trees integrated into one consistent symbol. There are, in the Qur’ân, three distinct supernatural trees: (1) the Infernal Tree, Zaqqûm, in Hell, (2) the Lote Tree of the Uttermost Boundary, Sidrat al-Muntahâ, in the Seventh Heaven and (3) the Tree of Knowledge, the forbidden tree in the Garden of Eden. A fourth tree, mentioned in the Lamp Verse, the “olive neither of the East nor West”, will be dealt with finally. Its crop is, as it were the heads of devils. And lo! They verily must eat thereof, and fill their bellies therewith. In the Jewish tradition, it is the Tree of Life in Eden that is expanded in post-Biblical writings like the Talmud into a full-blown symbolic complex. The Islamic World Tree, though, looks to the Star Sûra and the Lote Tree of the Uttermost Boundary for its archetype. Among thornless lote trees and clustered plantains, and spreading shade, and water gushing, and fruit in plenty. (Qur’ân LVI: 28-32). Since this passage speaks of the lote trees in plural, it could not refer to the Lote Tree of the Uttermost Boundary, which is a unique tree. In the Hadîth literature, though, the two passages merge, and the lote tree in the Seventh Heaven combines elements of the trees in both the Star and the Event Sûras. It is a unique tree, as in the Star, but it is located among the fountains and is the source of the fruit and shade mentioned in the Event. Each of these elements, the unique tree, the fountains, the fruit and the shade are important to the paradisal tree of the Hadîth, called Shajarat al-Tûba, Tree of Bliss, a name not found in the Qur’ân, and a concept with only a vague Qur’ânic basis. Recite (iqrar) then, if you want: “and of a spreading shade”. (Qur’ân LVI: 30). Verily, half a bow length in Paradise exceeds all this upon which the sun rises and sets. Here, “recite” apparently means “refer to” (Qur’ân LVI: 30). These two hadîth show the fusion of the two Qur’ânic lote tree passages. The “spreading shade” of the lote trees in the Event Sûra is cited in relation to the unique tree of the Star Sûra. The transporting of the word “shade” to the unique tree of the Seventh Heaven has special significance in that shade is an important symbolic quality of the Islamic Tree of Bliss. In a marginal note to Muslim’s Al-Jâmi ‘al-Sahîh, al-Nawawî says the shade is a metaphor for the bounty, comfort and protection of the paradisal tree. Naturally, in the scorching sun of Arabia, a tree bestows a specially appreciated blessing in the comfort of its shade. By extension, the miraculous tree in Paradise bestows all comforts and blessings upon the fortunate ones who rest beneath it. In modern Arabic, the expression, “in the shadow (shade) of the king” is roughly equivalent to our “under the aegis of the king”. The outward symbol is a real thing, and its application to the inward meaning is a real truth. Every real thing has its corresponding real truth. Bliss is a tree in Paradise, a tree of a hundred years’ walk, and those under the tree are clothed in clothes from the sleeves (i.e. flower calixes) of the tree. “It is a tree in Paradise, wherein is a tree called Bliss (Tûba)”. Then the Bedouin asked, “Which tree of our Earth does it resemble?” The Prophet replied, “It does not resemble any tree of your Earth”. The true soul remains perpetually extinguished in the Garden of the Heart and is perpetually reborn from it; and this perpetual merging of death into birth, which is denial of death, is the immortality from which the tree and the fountain take their name. “There is a tree, unique in all the quarters of the world: its fruit is of the substance of the Water of Life. Very high and very grand and very far-spreading: it is a Water of Life from the all-encompassing Sea of God. Thou hast gone after the form, thou hast gone astray: thou canst not find it because thou hast abandoned the reality. Sometimes it is named ‘tree’ sometimes ‘sun’; sometimes it is named ‘sea’, sometimes ‘cloud’. It is that one thing from which a hundred thousand effects arise: its least effects are everlasting life. Here, Rûmî equates the tree of knowledge with the tree of immortality, that is, equates knowledge with immortality. This tree of knowledge, however, is certainly not the forbidden tree of the Qur’ânic Garden of Eden, nor does it resemble the Tree of Knowledge in Jewish tradition, which, even in post-biblical writings, retains its accursed nature. And she took of its fruit, as it is said, and pressed the grape out and gave it to him, and thereby brought death to the whole world. For in this tree was death and this is the tree which prevails in the night. Similarly, the Islamic Tree of Immortality sheds its original stigma of being the temptation of Iblîs and is incorporated into the symbolic complex of the Muslim World Tree. A common scene in Muslim art depicting a tree surrounded by wild animals may show that the paradisal tree retained its forbidden, guarded nature in Islam, but it is more likely that these scenes are lifted straight from general Middle-Eastern art, where they are common, without retaining any symbolic meaning. The Prophet said, “In Paradise, there is a Tree of Bliss whose root is in my dwelling place and whose branches shelter all the mansions of heaven; nor is there mansion or dwelling place which lacks one of its branches. Every branch thereof bears every species of fruit that has been in the world. And every flower that has been in the world blossoms on that branch, but more abundantly and splendidly than the fruits of the world, and fairer than its flowers. And the Tree of Bliss bears grapes, every cluster of which is longer than a month’s journey, and each single grape is as big as a swollen water skin.… Each of the blessed has his own branch with his name inscribed on it”. Ibn ‘Arabî’s cosmology depicts the entire universe as a series of concentric spheres, beginning with the sphere of Earth, then the spheres of water, air, ether, moon, Mercury, Venus, Sun, Mars, Jupiter, Saturn and Fixed Stars. Beyond the Fixed Stars is the Paradise of the Elect, bounded by the primum mobile, the starless sphere, above which is the Throne of Allâh Himself. 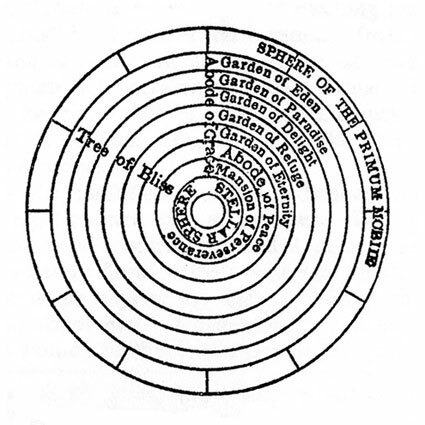 Between the spheres of the Fixed Stars and the primum mobile, then, are the eight concentric spheres of Paradise. Actually, there are only seven concentric spheres. The Abode of Grace, associated with the Prophet, spans all the others. Each sphere holds innumerable grades, which in turn contain countless individual mansions. The Tree of Bliss in Ibn ‘Arabî’s plan grows inverted from the primum mobile, with its roots in the Abode of Allâh, its trunk spanning all the seven levels of Paradise, and its inscribed branches penetrating each of the individual mansions of bliss. Note that Ibn ‘Arabî names the seventh region of Paradise the Garden of Eden, so the Tree of Bliss, like the Jewish Tree of Life, grows in the centre of Eden according to his cosmology. The passage from the Qurrat al-‘uyûn suggests inversion by locating the root of the Tree of Bliss in Allâh’s abode, but the actual doctrine of inversion begins with Ibn ‘Arabî. The inversion of the Tree of Bliss is of double significance. First, by inversion, the Tree of Bliss is rooted in the ground of Being and fed by the water of Essence. Its roots are in the dwelling place of Allâh, so the Tree draws its life from the Essence of Unity Itself, as an earthly tree draws its life from water, symbol of the essential unity of creation. As if the water of the Essence of Unity were too abundant to be absorbed even by the Tree of Bliss, it gushes forth in various rivers and fountains of Paradise. Secondly, Inversion is itself an important symbol in Islam, representing the incomprehensibility of the transcendent by rational means. It is the cosmic principle of inversion that causes a tree on earth to be inverted when reflected in a pool of water. Although the image in the pool is recognised as somehow connected with the tree, the image is on a lower plane of existence, devoid of all the real tree’s beneficent qualities: stability, shade and fruit. Similarly, the earthly tree is only a faint image of the divine Tree of Bliss. An intelligent man, seeing the image of a tree in a pond will look up to see the tree itself. A wise man, seeing the tree will look beyond it to the archetypal tree standing inverted at the centre of the universe. “O man of vanity, the marks are within the heart: that which is without is only the marks of the marks”. The real orchards and verdure are in the very essence of the soul: the reflection thereof upon that which is without is as the reflection in running water. In the water there is only the phantom of the orchard, which quivers on account of the subtle quality of the water. The real orchards and fruits are within the heart: the reflection of their beauty is falling upon this water and earth. The doctrine of inversion is not exclusively the possession of esoterism, but finds expression in everyday Islam as well. A common feature in Islamic religious architecture, for example the Taj Mahal, is a reflecting pool, a reminder that the Real stands to this world as the mosque to its reflection in water. Often a mosque dome is decorated with an intricate, branching floral design radiating from the apex of the dome. In some cases, as for example the Dome of the Rock in Jerusalem, this pattern almost certainly represents the Tree of Bliss, its branches growing downward from Paradise and spreading to fill the sky, which is represented by the dome. Similar designs also adorn the dome of the Sehzade Mosque in Istanbul and the dome of the mosque in the Taj Mahal enclosure. The dome of Gawhar Sahd’s mausoleum in Herat, Afghanistan, calls to mind the Hadîth passage, “There is no mansion or dwelling place which lacks one of its branches”. A floral pattern radiates from the apex of the central dome and is continued in the numerous quarter-domes that are grouped symmetrically around the main dome. In each of the quarter-domes, the floral pattern explodes palmately from the apex, as if it were the culmination of a branch of the Tree of Bliss in one of the individual mansions. The dome of the Lutfullah mosque in Isfahan bears a sunburst motif with an eight-pointed star at its apex. The space inside the sunburst is filled with a spiraling tendril design, and outside the sunburst is a radiating floral pattern representing the Tree of Bliss. Thus, the entire dome depicts the Tree of Bliss with the sun in its branches, an important motif in Islam and a recurrent one in world mythology. It would be difficult to overstate the symbolic importance of light, and thus the sun in Islam. Light, writes Ibn ‘Arabî, is “that which in the phenomenal world is least separated from the divine”. In Sufism, night represents this world and day the next world, and the sun which lights the day corresponds to the Spirit which lights Paradise. Allâh is the light of the heavens and the earth. (Qur’ân XXIV: 35). When there enshrouded the lote-tree that which enshroudeth, the sight wavered not, nor did it transgress. Verily he saw one of the Greater Signs of his Lord. He (the Prophet) was not veiled by it (the lote tree) and its form, nor by Gabriel in the fullness of his angelhood, from the Truth when it overflowed upon the lote tree. Thus, the revelation to the Prophet beside the Lote Tree of the Uttermost Boundary is, and almost inevitably so, conceived of in terms of light. Not without basis is the view that the dome of the Lutfullah Mosque, with its sunburst and Tree of Bliss, is a representation of Allâh’s revelation to the Prophet in the Seventh Heaven, even regardless of the architect’s intention. Allâh is the light of the heavens and the earth. The similitude of His light is as a niche wherein is a lamp. The lamp is in a glass. The glass is as it were a shining star. This lamp is kindled from a blessed tree, an olive neither of the East nor of the West, whose oil would almost glow forth (of itself) though no fire touched it. Light upon light, Allâh guideth unto His light whom He will. And Allâh speaketh to mankind in allegories, for Allâh is Knower of all things. This verse has served as the basic blueprint around which all mosques grand and small have been designed, with a niche at the qibla before which hangs a lamp. The blessed olive tree takes on great importance in Muslim prayer rugs, miniature mosques, which embody in portable form all the essential characteristics of the mosque: the niche, ritual purity and an axis of symmetry which may be oriented toward the qibla. Most prayer rugs depict a lamp, often in highly stylised form, hanging before the niche, just like the mosque, and there is often a tree in the niche too. Considering the close relationship between Qur’ân XXIV: 35, the mosque, and the prayer rug, it is quite possible that the tree is simply the “olive neither of the East nor of the West”. A graphic example of this interpretation is a rug woven by the semi-nomadic Kula tribe of western Turkey which shows a niche and lamp with a stylised tree descending from the lamp as if it were feeding the lamp directly with oil. Most of the trees depicted on prayer rugs, however, bear no resemblance to the olive. Indeed, most of them cannot be botanically identified with any type of tree, and many of them are so stylised that they scarcely resemble trees at all. Quite commonly, though, the tree is obviously a fruit tree. Thus the more elegant interpretation: The prayer rug depicts the niche opening up on a view of Paradise, in which case the tree is the Tree of Bliss. The theme of a gate or doorway opening to Paradise is one of the most ancient and widespread symbols, used frequently in the Qur’ân itself. In view of the crucial importance of the prayer niche, this view is persuasive. The phrase “neither of the East nor of the West” suggests centrality and is therefore open to being interpreted as applying to the Tree of Bliss, and the water symbolism mentioned earlier plays an important part in the paradisal motif of Muslim prayer rugs. Often a rug depicts a tree growing out of a vase, symbolising a divine source of water, and on some rugs may be seen aquatic fowls which indicate the proximity of water in paradisal symbolism. The axis of symmetry of the prayer rug is analogous to the horizontal axis of the mosque, which points to the qibla, and it is associated with the axis mundi of the cosmos. When the worshipper kneels upon the rug to pray, he sees the symbolic scene of Paradise and thinks of the Real scene as he calls upon Allâh to guide him to Paradise by the sirât al-mustaqîm, the “path of the upright”. Al-Ghazâlî, Mishkat al-Anwar, p. 29, Cairo edition. English translation: The Niche for Lights by W. H. T. Gairdner, Royal Asiatic Society, London, 1924, p. 71. Un-noted passages are from Mohammed M. Pickthall’s translation of the Qur’ân: The Meaning of the Glorious Koran, George Allen and Unwin, London. But here, I use Abû Bakr Siraj Ed-Dîn, The Book of Certainty, Samuel Weiser, New York, 1970, p. 48, except for “reflect”, which is Pickthall’s word instead of Ed-Dîn’s “remember”. Abû Bakr Siraj Ed-Dîn, The Book of Certainty, p. 56. S.Radhakrishnan, The Principal Upanisads, George Allen and Unwin, London, 1968. Note Qur’ân LXXXII: 7, “Who created thee, then fashioned, then proportioned (a’dalaka) thee?” Here, a’dalaka connotes “setting upright”. In Qur’ân XCV: 4, “Verily we created man in the fairest rectitude”. (Book of Certainty, p. 44) Tagwim (rectitude) is related grammatically to the verb qama, “to erect” or “set up”. Note also in al-Fatihah, “the path of the upright”, sirat al-mustaqim. Abû Bakr Siraj Ed-Dîn, The Book of Certainty, p. 100. Encyclopaedia of Religion and Ethics, James Hastings (editor), T. and T. Clark Edinburgh 1908, vol. IV, p. 330b. Dictionary of Folklore, Maria Leach (editor), Funk and Wagnells Co., New York, vol. II, p. 1123. Encyclopaedia of Religion and Ethics, vol. IV, p. 330b. Ibid., vol. I, p. 164b. Philpot, Isaline H., The Sacred Tree, Macmillan and Co., London 1879, p. 117. Encyclopaedia of Religion and Ethics, vol. VIII, p. 76b. Philpot, The Sacred Tree, pp. 118, 120. Radhakrishnan, The Principle Upanisads. See Katha Upanisad VI, 1. Sayce, A. H., The Religion of the Ancient Babylonians, London, 1887, p. 385. Thompson, R. Campbell, The Devils and Evil Spirits of Babylonia, London 1903, vol. I, Introduction. Mackenzie, Donald A. Myths of Babylonia and Assyria, Gresham Publishing Co., London, n.d., p. 178. Gaster, Theodor H., Myth Legend and Custom in the Old Testament, Harper and Row, New York, 1969, p. 34. Philpot, The Sacred Tree, p. 117. Gray, John, The Caananites, Thames and Hudson, London, 1964, pp. 226, 227, 231; plates 6, 9, 10, 32. II Samuel V: 24, Bible. See Kitâb al-Aghani, Bulaq, 1868 A.D. (1284-5 A.H.) vol. I, p. 14. (cited below, p. 7). Revelation XXII: 2, Bible. It is said among Christians that man fell because of a tree (the Tree of Knowledge); was saved by a tree (the cross); and in heaven will rest beneath a tree (the Tree of Life). Philpot, The Sacred Tree, p. 123. Wasson, R. Gordon, Soma: The Divine Mushroom of Immortality, Harcourt, Brace and Jovanovich, New York, 1971. Campbell, Leroy A., Mithraic Iconography and Ideology, E. J. Brill, Leiden, Netherlands, 1968, p. 35. See Zohar, Mantua, ed. vol. I, p. 36 (cited below p. 14), where the Tree of Knowledge (Death) prevails at night, thus corresponding here to the dead tree with the moon in its branches. See also Zohar vol. III. pp. 119-20 where day and night correspond to the Trees of Life and Death. Campbell, Mithraic Iconography and Ideology, p. 113. Ousley, W., Travels in Various Countries, London, 1819-23, vol. VI, p. 369. From Philpot, The Sacred Tree, p. 99. Ali ibn al-Husain Abû al-Faraj al-Isbahâni, Kitab al-Aghani, Bulaq, 1868 A.D. (1284-5 A.H.), vol. I, p. 14. See II Samuel V: 24 (cited above, p. 6). Robertson-Smith, William The Religion of the Semites, A. and C. Black, Edinburgh, 1889, p. 169. Philpot, The Sacred Tree, p. 119. Cragg, Kenneth, The Dome and the Rock, S.P.C.K. Holy Trinity Church, London, 1964, p. 203. Ameisenowa, Zofja, “The Tree of Life in Jewish Iconography”, Journal of the Warburg and Courtauld Institute, vol. II, 1938-39, p. 329. See Qur’ân VII: 19-20 and II: 35. Abû Bakr Siraj Ed-Dîn, The Book of Certainty, p. 26. Al-Bukhârî, Les Traditions Islamiques, Translation by O. Hondas, Imprimère National, Paris, 1903-1914, titre LIX, p. 442. Muslim, Al-Jami ‘al-Sahîh, A. H. 1332, no place of publication indicated, p. 144, (“Janna”, nos. 6-8). The edition used is shelf-marked S.G.L. III-429 at London University S.O.A.S. Library. See also: Ibn Hanbal, Musnad, Cairo 1895 (1313 A.H.), vol. II, p. 482. In several passages, Abû Huraira gives his hadîth with the modification that the rider “could not traverse the shade in 100 years”. Muslim p. 144; Ibn Hanbal, vol. II, pp. 438, 452, 469, vol. III, pp. 110, 135, 185, 207, 234. And according to Abû Sa‘id al-Khundrî, the horseman may even be “mounted on a fast steed”. Al-Bukhârî, titre LXXXI, p. 308. See Ibn Hanbal, vol. II, p. 404; Muslim, p. 144. Hadîth reference from A. J. Wensinck, A Handbook of Early Muslim Tradition, E. J. Brill, Leiden, 1927, p. 183. Al-Bukhârî, titre LIX, p. 442; Ibn Hanbal, vol. II, p. 482. Muslim, p. 144 (“Janna”, marginal note to nos. 6-8 by Yahya ibn Sharaf aI-Nawawî). Ibn Hanbal, vol. III. p. 164. Muhammad ibn ‘Abd Allah al-Khatîb al-Tibrîzî Mishkât al-Masâbih, translation by A. N. Matthews (sic), Calcutta, 1823. I use Matthews’ translation except for bâtinîya and zâhirîya which he translates “hidden” and “manifest”. Mishkât al-Anwâr, Bulaq ed., p. 37. Gairdner translation, Royal Asiatic Society, p. 79. Ibn Hanbal, vol. III, p. 71. Ibid., vol. IV, p. 183. Ibid., vol. II, pp. 445, 462. Abû Bakr Sirâj Ed-Dîn, The Book of Certainty, p. 26. In Persian gardens, fruit trees and cypresses are often planted together. The cypress symbolizes death, because once cut, it never sprouts anew. The fruit tree symbolizes life and resurrection. Juxtaposed, they symbolize the inter-dependence of life and death, and gardeners often train the branches of the fruit trees to entwine around the cypresses. On Kula prayer rugs, of the type popularly referred to as “cemetery rugs” or mezarliks, one may find tiny cypress trees with tombs underneath incorporated into the design. James Dickie, “The Iconography of the Prayer Rug”, Oriental Art, Spring, 1972, pp. 44, 46. Julia S. Berrall The Garden, Thames and Hudson, London, 1966, p. 57. Abû Bakr Sirâj Ed-Dîn, The Book of Certainty, p. 91. Jalâl al-Din Rumi, Mathnawi, translation by R. A. Nicholson, Luzac, London, 1926, Book II, p. 412, lines 3666-3673. The Zohar, Mantuna ed., vol. 1, p. 36a. English translation by Zofja Ameisenowa, “The Tree of Life in Jewish Iconography”, Journal of the Warburg and Courtauld Institute, vol. II, 1938-9, p. 337. See note 38 above. Sefer Midrash Konen, editor Isak Zinger, Isak Zinger Publishing Co. Rawa-Ruska, 1898, p. 7. I used a translation of the passage by Zofja Ameisenowa from “The Tree of Life in Jewish Iconography”, Journal of the Warburg and Courtauld Institute, vol. II, 1938-9 p. 336, which is noted as taken from “Bethha-Midrash, Ed. Jellinck VI, 28,” but this appears to be a misprint. The Zinger edition gives the height of the tree as “five hundred” years, not “five hundred days” as in the Ameisenowa article. The Zohar agrees with the dimension of five hundred years, Zohar, Mantua, ed., p. 35a, so I have substituted “years” for “days”. For a photographic example see: David Talbot Rice, Islamic Art, Thames and Hudson, London 1965, p. 23. Abû Bakr Sirâj Ed-Dîn, The Book of Certainty, p. 40. Qurrat al-`uyûn, Cairo, 1902 (1320 A.H.) pp. 189-90. Translation of most from James Dickie, “The Iconography of the Prayer Rug”, Oriental Art, Spring, 1972, p. 43. Asin-Palacios, Miguel, Islam and the Divine Comedy, p. 151. From al-Futûhât al-Makkîya, Bulaq, 1293 A.H., III p.554. Asin-Palacios, Miguel, Islam and the Divine Comedy, pp. 150-3. Qur’ân LV: 50; LXXVI: 5-6 LXXXIII: 25-8. Rûmî, Mathnawî, vol. VII, p. 347, lines 1362-65 in Nicholson’s translation. See Dickie, “The Iconography of the Prayer Rug”, Oriental Art, Spring, 1972, p. 46, fig. 9; and Oleg Graber, Formation of Islamic Art, Yale University Press, New Haven and London, 1973, illustration 7. Vogt-Goknil, Ulya, Living Architecture: Ottoman, Oldbourne, London 1966, p. 82. Volwahsen, Andreas, Living Architecture: Islamic Indian, Macdonald, London, 1970, p. 117. Qurrat al-‘uyûn, Cairo, 1920, p. 189. Hill, Deric and Oleg Graber, Islamic Architecture and Decoration, Faber and Faber, London 1967, fig. 128. Abû Bakr Sirâj Ed-Dîn, The Book of Certainty, p. 65. Ibid., p. 26. Regarding “transgress”, the Prophet is said to have said, “Thy existence is a sin wherewith no other sin can be compared”. Formenton, Fabio, Oriental Rugs and Carpets, Hamlyn, London, 1972, p. 97; photograph on p. 99. Dickie, “The Iconography of the Prayer Rug”, Oriental Art, Spring, 1972, p. 44. Qur’ân VII: 40; XIII: 23. Man has an eternity within him, is born into this world, not for the sake of living here, not for anything this world can give him, but only to have time and place to become either an eternal partaker of a divine life with God or to have an hellish eternity among fallen angels.